Shawn Tulecke-Paulson, "Veterans to speak at HSU," The Lumberjack (Humboldt State University), April 26, 2005. Charlie Liteky, a Vietnam War veteran, went to Baghdad in the spring of 2003 to witness and protest U.S. troop invasion. Camilo Mejia, a U.S. soldier, was in Baghdad that same month. Six months and many firefights later, Mejia returned to the United States, became a conscientious objector, refused to go back to Iraq and was sentenced to a year in military prison. Liteky and Mejia, along with six others, will be speaking at a four-day No More War Teach-in at HSU Wednesday through Saturday. The No More War Teach-in includes a scheduled HSU walkout Thursday at 2 p.m., when organizers are encouraging students to walk out of class to see a speaker’s panel... The teach-in commemorates the end of the Vietnam War. 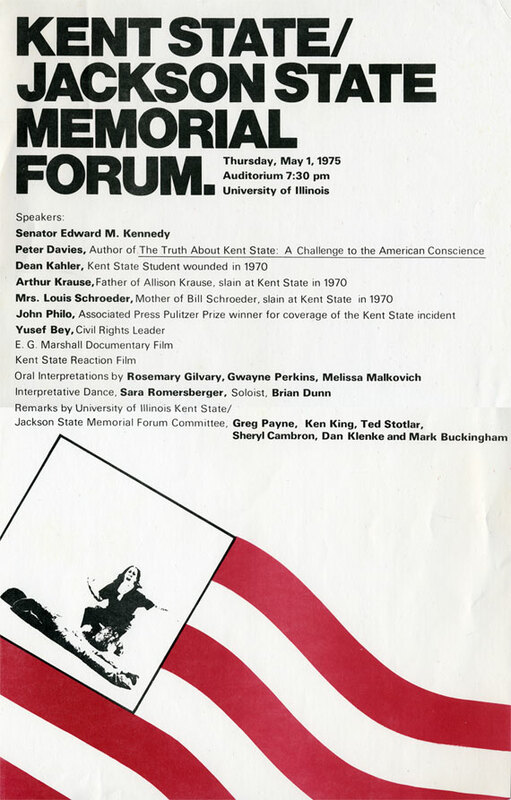 Two teach-in speakers, Joseph Lewis and James Russell, were shot at Kent State University in Ohio in 1970. On May 4, 1970, National Guardsmen fired into a crowd of unarmed protestors at Kent State, killing four and wounding nine. Thirty-five years later, this monumental tragedy has become a blurb in history books- forgotten by many. However, now, more than ever, at a time when our nation is so divided on political and moral issues, it is crucial that we remember the horror of May 4th. 35 years ago, we lived in a world where many of our leaders, and citizens were intolerant of dissention. Where awareness, and criticism of the United States Government by students was not applauded for its intellectual context, but rather shunned and silenced. We are taught that by ignoring history’s lessons, we are bound to repeat its mistakes. It seems that history has escaped us once again. The murders at Kent State should have taught us many things about our government and our people. Now its thirty five years later and still we blunder.